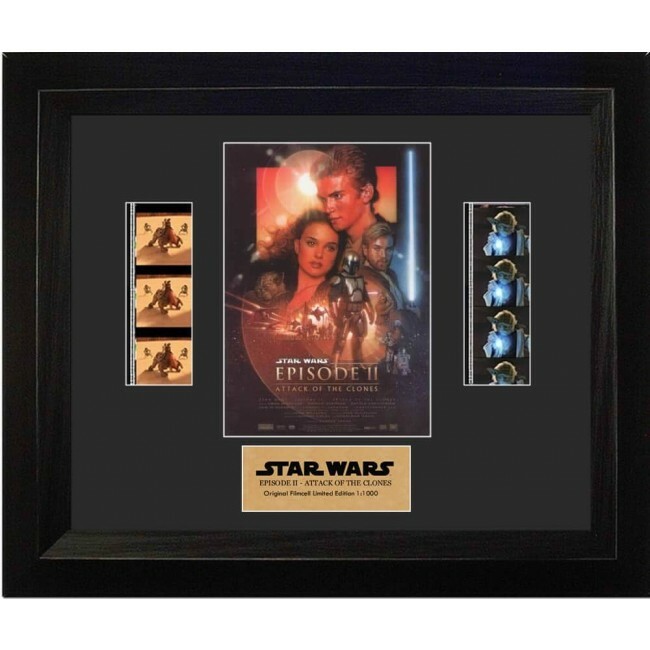 13" x 11" | Film Cell Clips | Limited Edition of 1000 | Framed | Ten years after the "Phantom Menace" threatened the planet Naboo, Padm Amidala (Natalie Portman) is now a Senator representing her homeworld. A faction of political separatists led by Count Dooku (Christopher Lee) attempts to assassinate her. There aren't enough Jedi to defend the Republic against the threat so Chancellor Palpatine (Ian McDiarmid) enlists the aid of Jango Fett (Temuera Morrison), who promises that his army of clones will handle the situation. 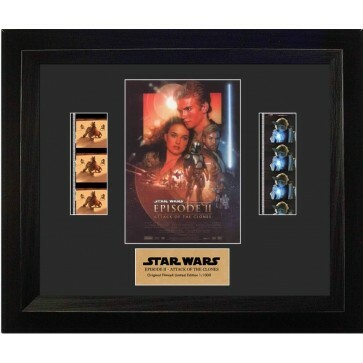 Meanwhile Obi-Wan Kenobi (Ewan McGregor) continues to train the young Jedi Anakin Skywalker (Hayden Christensen) who fears that the Jedi code will forbid his growing romance with Amidala... | This item contains clips of film, an image portraying the movie(s), artist(s) or character(s) and a stunning descriptive plaque. These elements have been double mounted and placed within a beautiful black wood frame. Each item comes with an official ? Trend Setters Ltd. certificate stating its authenticity. The film strip portrayed in the image above is only an example of the film cells you may receive. Please note, the cells may vary from piece to piece because they are hand selected from reels of film.